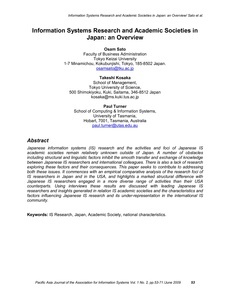 Japanese information systems (IS) research and the activities and foci of Japanese IS academic societies remain relatively unknown outside of Japan. A number of obstacles including structural and linguistic factors inhibit the smooth transfer and exchange of knowledge between Japanese IS researchers and international colleagues. There is also a lack of research exploring these factors and their consequences. This paper seeks to contribute to addressing both these issues. It commences with an empirical comparative analysis of the research foci of IS researchers in Japan and in the USA, and highlights a marked structural difference with Japanese IS researchers engaged in a more diverse range of activities than their USA counterparts. Using interviews these results are discussed with leading Japanese IS researchers and insights generated in relation IS academic societies and the characteristics and factors influencing Japanese IS research and its under-representation in the international IS community. IS Research, Japan, academic society, national characteristics.